Many trails along the Byway permit mountain biking. The North Coast Cycling Association has produced a biking/hiking map for several different routes throughout the City of Washburn. The map includes a tour of the newly formed East 3rd Street Residential Historic District, historic sites throughout the city, the Lake Superior waterfront and a long loop route. Funding for this map was provided by Washburn Community Education Foundation and assistance provided by the Washburn Heritage Association. 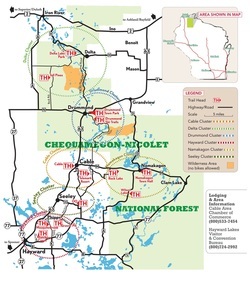 The Chequamegon Area Mountain Bike Association off-road bike trail system consists of over 300 miles of marked and mapped routes through a near-wilderness area of striking beauty and peaceful solitude. The CAMBA system is quickly becoming the Singletrack Mecca of the Midwest, with more singletrack trail being constructed every year. Mt. Ashwabay, located just off of the Byway, offers mountain biking trails with spectacular views of Lake Superior. The NCCA is a non-profit organization formed to promote bicycling in Bayfield and Ashland Counties. Bayfield and Ashland counties offer some of the most scenic cycling routes in the state, and the region is receiving increased tourist use, as well as local commuters and recreational riders.